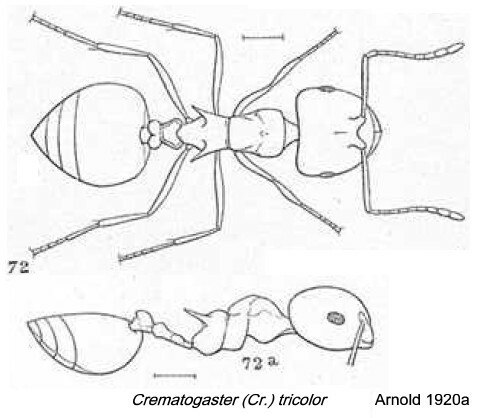 Type location Mozambique (Gerstäcker, 1859: 263, worker; Forel, 1887: 388, queen & male; Arnold, 1920a: 489 - see below . 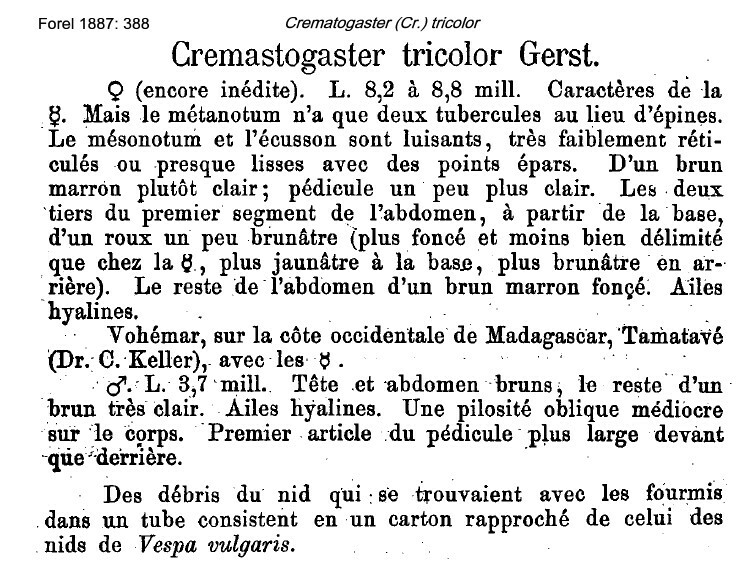 Gerstäcker's (1859) description of tricolor is at . It was translated and illustrated (above right) by Arnold (as a race of castanea, 1920a: 489) and is at and . 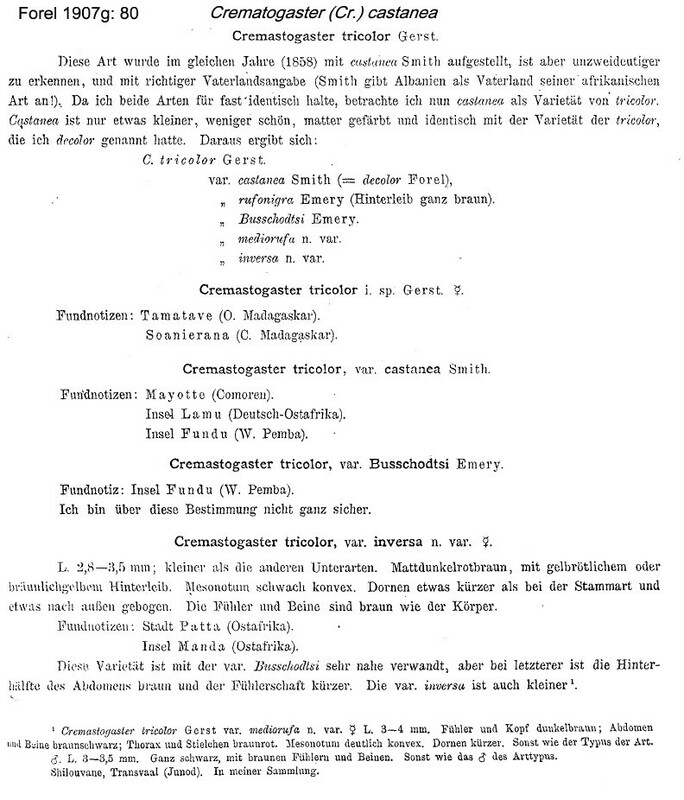 Forel's (1887) description of the male and queen is at . Santschi (1926b) deals with several varieties, these are at . With the availability of photographs of the type specimens and the fresh material from Tanzania (bottom), which shows the brightness of the tricolouration, I have restored tricolor to its original species status. 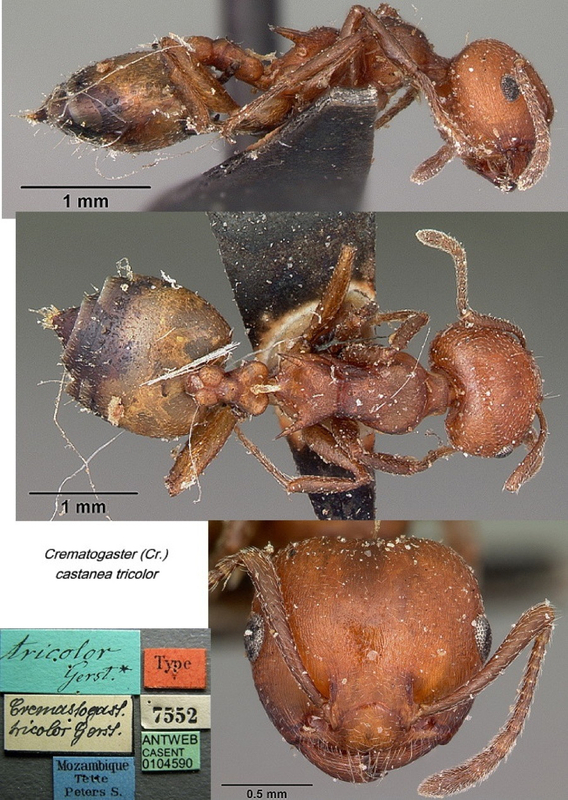 It clearly differs in a number of ways, not least the distinctive colouration from Crematogaster (Cr.) castanea under which it has been subjugated for so long. The forms listed by Bolton (1995: 150) as pertaining to castanea but fairly obviously variations of tricolor are listed below. 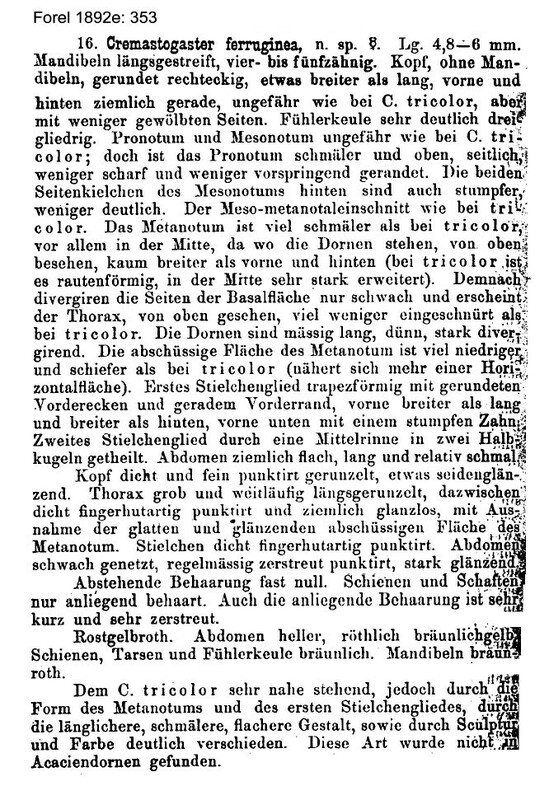 From Bolton's listing, the synonymization of tricolor under castanea, was due to Mayr (1907b:16), followed by Emery (1915g: 12) and Wheeler (1922: 830); however Bolton also has - "revived from synonymy as variety/subspecies of castanea" - Arnold (1920a: 489), Emery (1922e: 145) and Santschi (1926b: 213). This frankly added confusion to an already confused state. In fact, Mayr (1907b) listed tricolor with castanea and arboreus as junior synonyms. Emery (1915g) reported how it had been determined by W C Crawley, of the British Museum, that the F Smith name castanea was published on 28 March 1858, giving it priority over the publication of tricolor by Gerstäcker on 12 April the same year - 1858 - not 1859 as in Bolton's reference list. 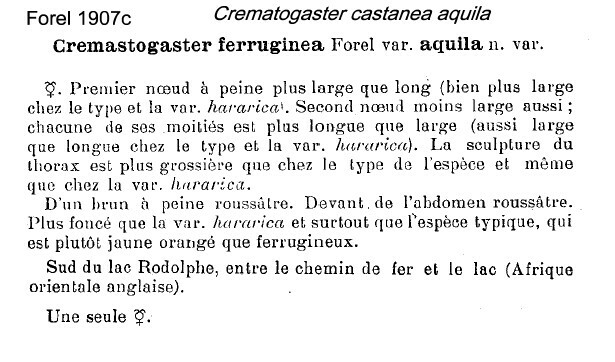 Therefore, Emery declared the various synonyms of tricolor had to be regarded as synonyms of castanea; apparently attributing the list to Forel's subspecies ferruginea (1892e). But that was described by Forel as a distinct species [more like castanea in colouration]. 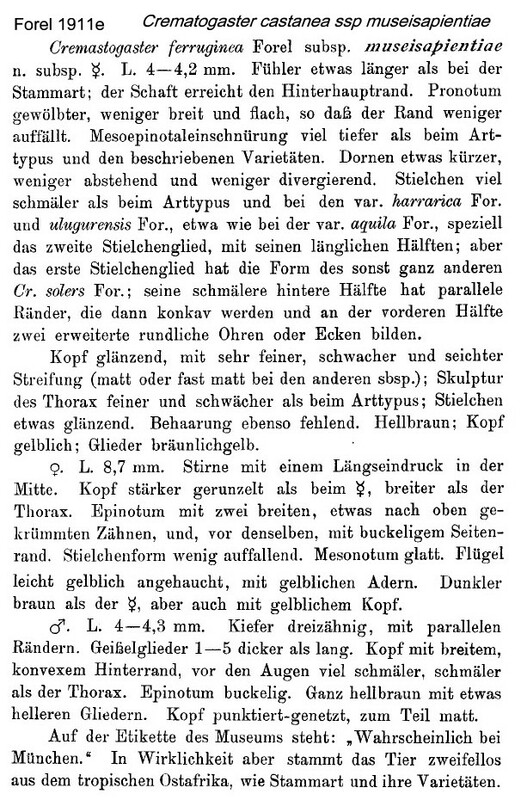 According to Arnold (1920a), Mayr (1896) appears to have synonymized arborea with tricolor. Arnold himself added "(=castanea, Smith, race tricolor Gerst.)". Wheeler (1922a: 830) merely listed all the forms under castanea but gave no arguments for or against the synonymization. Emery (1922e: 145) was solely a listing of all the castanea and tricolor varieties etc. under castanea. Santschi (1926b: 213) in the nearest thing to a definitive statement noted; on castanea - "I think to limit to this species the forms where the pronotum is frankly flat and distinctly bordered (as seen in front view); on tricolor, he continued "I consider as a variety tricolor Gerst. with the head and the alitrunk distinctly more red and with a paler base to the gaster than " la var. castanea type", where this base is dark (obscure rufo-fuscous, as written by F Smith). The sculpture is identical. 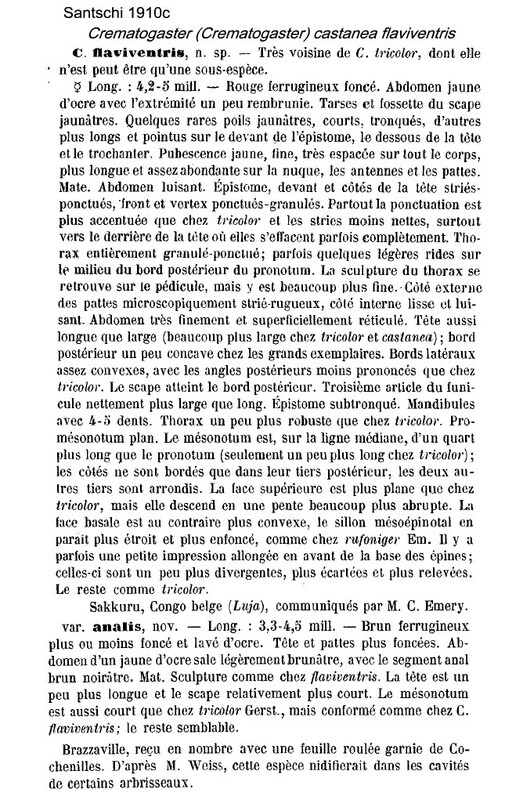 Forel (1911f) reported inversa and castanea, both as varieties of inversa, from Zaïre, Kasai, Kondué by Luja.Wheeler (1922) writing on analis and flaviventris noted - "This and the following are merely color varieties of an extremely variable and widely distributed African and Malagasy species formerly known as C. tricolor Gerstecker". Santschi (1935b) also saw several forms from Zaïre:- busschodtsi from Kisantu, Banana (from whence the type) and Congo la Lemba; noting that this variety has black brown antennae, darker than the head; inversa has these the same. Also busschodtsi strain emacerata (unavailable name according to Bolton, 1995) with propodeal spines as short as those of the ssp adusta; and, flaviventris from Kasai (Dumbi). aquila from Kenya (Cremastogaster ferruginea Forel var aquila n var, Forel, 1907c: 139, worker; Santschi, 1914b: 87, male). Forel's description is at . No images on Antweb (December 2014). busschodtsi from Zaïre (C. tricolor Gerst. var. Busschodtsi n. var., Emery, 1899e: 487, worker; Santschi, 1930a: 64, queen & male - noted by Santschi, 1935a, as actually variety inversa) collected at Banana, by Busschodts . 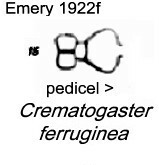 Emery's (1899e) description is at . Santschi (1935a: 257) noted this variety has antenna which are brown black and much darker than the rest of the head. No images on Antweb (December 2014). flaviventris from Zaïre (as n. sp., Santschi, 1910c: 370, all forms) collected at Sankuru, by Luja. 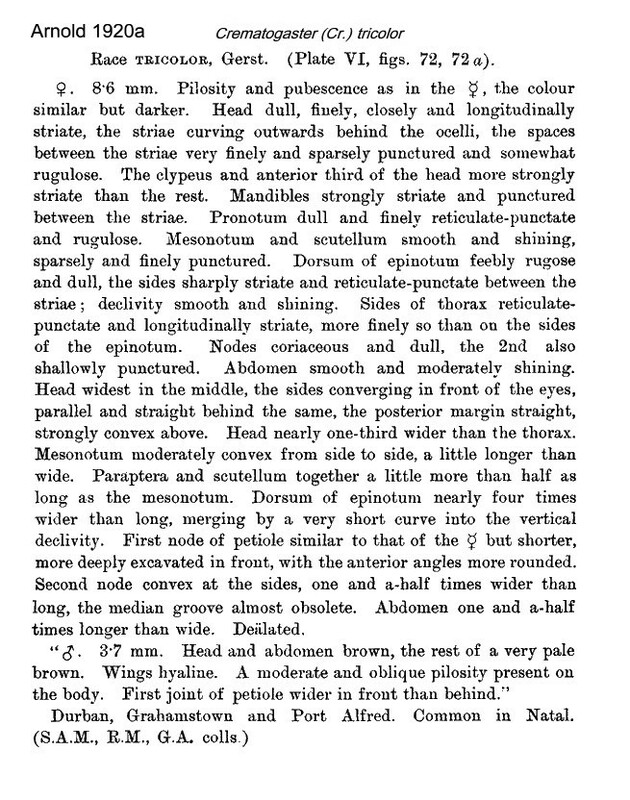 Santschi's description (1910c) of flaviventris and analis is at . 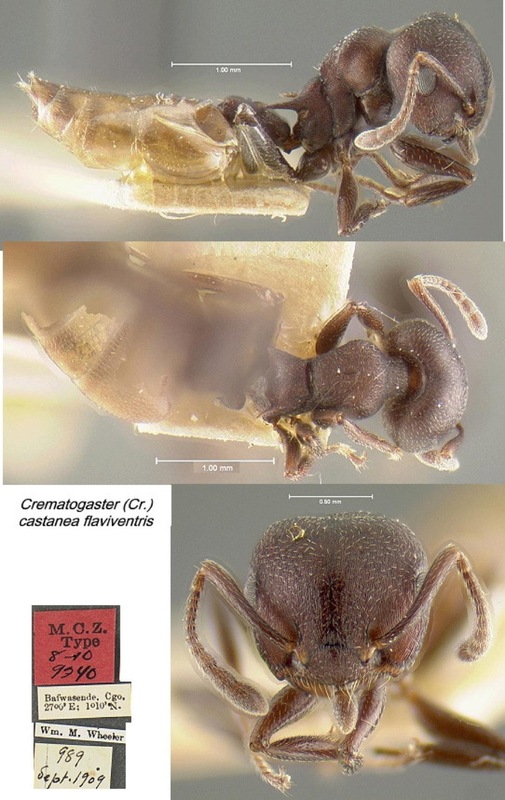 ulugurensis from Tanzania (Crematogaster ferruginea Forel v. ulugurensis n.var., Forel, 1911d: 369, worker; Santschi, 1914b: 86, queen & male) Uluguru Mountains and Morogoro, collected by Zimmer. Forel (1911d) noted ulugurensis as similar to but darker than harrarica; TL 3.5-5.2 mm; reddish brown, with the gaster more yellow red, legs and antennae brown; head subopaqe and very densely longitudinally striate; pronotum finely reticulo-punctate and coarsely reticulate or rugose with several irregular fossae. See http://www.antweb.org/specimenImages.do?code=casent0908507 - may be a variety of castanea. The photomontage is of a specimen from Tanzania, Mkomazi Game Reserve; collector G McGavin (tree 2-15). The photomontage is of a specimen from Tanzania, Mkomazi Game Reserve; collector G McGavin (tree 3-66). The photomontage is of a specimen from Namibia, Xakanaxa Camp, collector D M King (King 114).